Meet our team. We create, educate, mentor, and provide a platform with which other women, gender-identifying women, and Latinx people living on the U.S.-Mexico border can share their stories. Angie has worked in independent film since 2003 after graduating from the University of San Francisco with a B.A. in Media Studies and minor in Music. For twelve years, she worked as a producer, director, and editor in the Bay Area mentoring under Oscar-nominated and Sundance award-winning documentary filmmakers. Her awards in filmmaking include a 2012 Best Film made by an Adult at the San Francisco WritersCorps Poetry Projection Project Film Festival and a selection as semi-finalist for Best Art Short Film at the 2016 EQUUS Film Festival in New York City. Since 2011, Angie has lived and worked in El Paso. 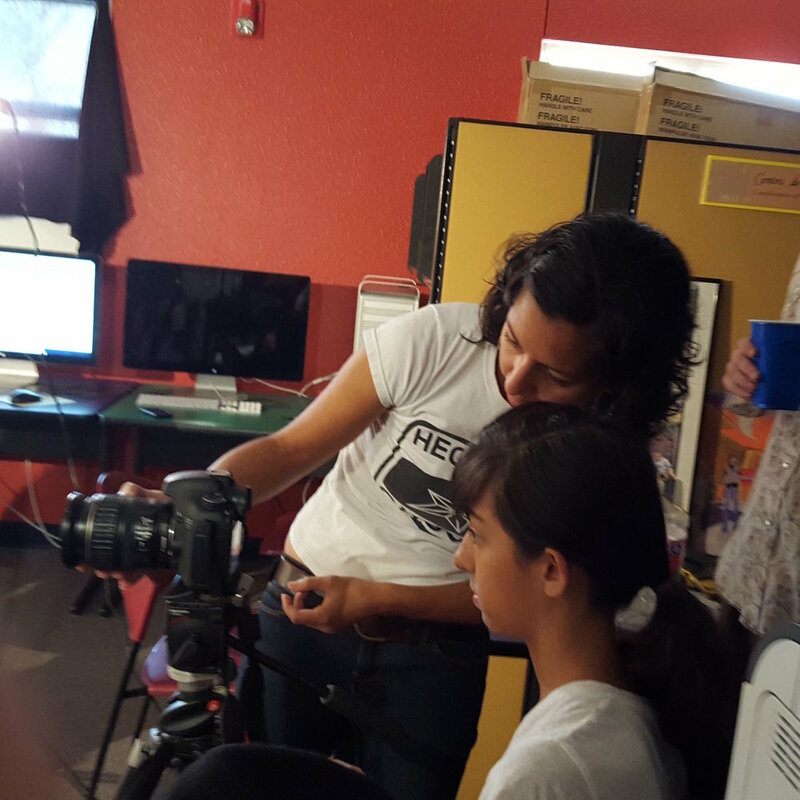 With the support from three community arts program grants from the El Paso Museums and Cultural Affairs Department, she teaches filmmaking to youth and works as a collaborating visual artist with the Caldo Collective as well as continuing her work as a filmmaker and as the Director of Femme Frontera. Iliana is a filmmaker based in Austin, Texas. She was born and raised in El Paso, Texas by Mexican immigrant parents. A former Bill Gates Millennium Scholar, she holds a MFA in film production and directing from UCLA. She is the recipient of numerous awards, including the Steven Bochco Fellowship, the Hollywood Foreign Press Award, the Edie and Lew Wasserman Fellowship and the National Hispanic Foundation of the Arts Scholarship, among others. Her MFA thesis film, CHILD OF THE DESERT, won Best Short Film and the Texas Award at the Oscar qualifying 2012 USA Film Festival. She was a 2013 Film Independent Project Involve Directing Fellow and was selected for the 2013 TransAtlantic Talent Lab in Reykjavik, Iceland. In 2014, she was selected for the Sundance sponsored Latino Screenwriting Project with her script, PAPER BIRDS LEARN TO FLY. Iliana has directed short documentaries, fiction shorts and a fiction feature, DETAINED IN THE DESERT, which had its World Premiere at the 2012 Los Angeles Latino International Film Festival. She is currently in post-production on her first feature documentary, JULIAN. Ilana is a filmmaker and educator interested in exploring the personal faces of global conflicts. She grew up in three countries (Israel, Canada and the US), and holds a BA from Yale University in Political Science. Lapid received a Fulbright in Romania to work with visual stories of Roma (Gypsy) children, before moving to LA to earn an MFA in Film Production from the University of Southern California. She has directed multiple short films that won awards at international festivals, including Red Mesa, which won several awards including Best Short at the LA Latino International Film Festival. Lapid was an Artist in Residence at the Slifka Center at Yale. A feature she co-wrote with Joshua Wheeler, Lordsburg, was a finalist at the Sundance Screenwriter Lab and is currently in development. Lapid recently wrote and directed a narrative short film, Yochi, shot in western Belize, that tells the story of the bond between two brothers threatened by the illegal wildlife trade. Yochi recently won Best Short at the 2016 Belize International Film Festival. La Catrina, her short in the Femmes Frontera Showcase, was an official selection for the 2016 Women in Film and Television International Showcase. Lapid is an Assistant Professor at the Creative Media Institute of New Mexico State University where she teaches directing, screenwriting and border cinema. Laura is a documentary filmmaker and photographer from the border of Mexico and the United States. She focuses on telling transformative stories about immigration, being a transnational woman of color, and social reconstruction within the Ciudad Juárez and El Paso region. She has a BA in Visual Journalism from Brooks Institute with a focus on documentary filmmaking. She is an alumni of the David Lynch MA in Film at Maharishi University, and in the production of documentary series “Undocumented Freedom.” Laura is also co-directing and collaborating on several projects with international artists from Algeria, Israel, United States, Colombia, and Mexico. Jazmin studied film at the Creative Media Institute at NMSU and graduated with her BFA in 2015. Overland was shot for her senior thesis project in 2015, and is her first film. Since graduating, Jazmin moved to LA and worked as a camera assistant. In addition, she was a videographer and editor for the American Civil Liberties Union of Southern California. Currently, she is in Albuquerque, NM working as a freelance cinematographer. Jennifer is a multimedia artist and activist using video production to build insightful interactions among communities. Graduating at the University of Texas at El Paso in Electronic Media Journalism and a minor in Women’s Studies, Lucero was determined to focus on crucial and diverse human experiences to be heard. In 2009, she connected with director and producer, Barni Qaasim, to produce and edit Catching Babies, a feature length documentary which explored the lives of mothers and midwives living on the US-Mexico border. Connecting with nonprofits as a community health educator, Lucero spent 2011 through 2014 producing multimedia presentations on pertinent health information- empowering people with education to make safe and conscious choices about their health. In 2016, she was awarded a grant from the City of El Paso to document the sound and story of women musicians from the Borderlands. The Appleseed Project plants seeds of inspiration around the musical platform it promotes. Intimate and confessional, women share their musical experiences against the sound of their own songs. Currently, Lucero works as a freelance multi-media consultant for nonprofits in her home city.